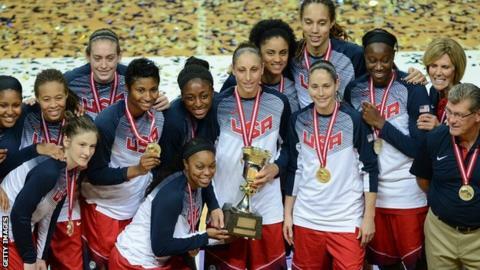 The United States beat Spain 77-64 to retain the Women's World Championship in Turkey on Sunday. The strong favourites sailed into a 13-point lead in the opening four minutes and after that were always at least seven points ahead. Forward Maya Moore scored 18 points and was voted the tournament's Most Valuable Player. The US have won every Olympic and world title since 1996, bar a semi-final loss in the 2006 World Championship. The Americans led Spain 48-29 at the half-time and were 25 points clear before Spain closed the game with a 14-2 run. Australia took bronze with a 74-44 victory over hosts Turkey. Canada beat China 61-53 to finish fifth and France secured a 88-74 win over Serbia for seventh place.